Home » News » Televised Event Sunday 26th October – Can we Turn Silver into Gold? Televised Event Sunday 26th October – Can we Turn Silver into Gold? Outstanding New Teacher of the Year, Ms Jane Westlake. 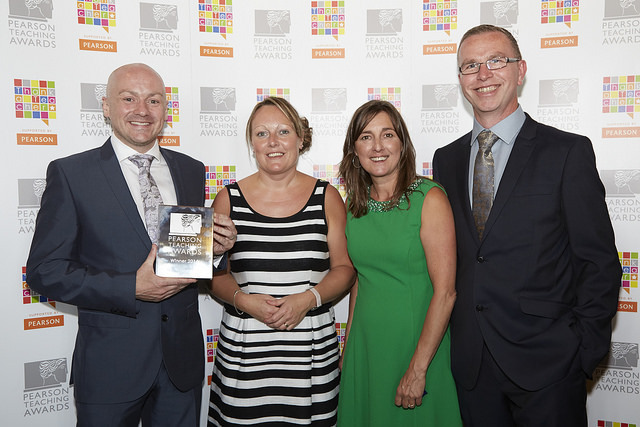 Mr Baker, leader of the ‘Outstanding Team’ with Mrs Pullin, Ms Westlake & Mr Simpson. This Sunday evening, 26th October, our Kilgarth Silver winners will join fellow Silver winners at the UK final. The event will be held at London’s Guildhall where a Gold Award will be identified from each of the 10 categories. The ceremony will be filmed and broadcast by the BBC. Best wishes to all for a wonderful evening!